The Telefunken AR-51 was created to bring the classic circuit of the ELA M 251E and C12 into a new, more affordable microphone. Featuring edge terminated TK51D capsule, a European NOS (New Old Stock) ECC81 vacuum tube and newly manufactured Haufe T14/1 output transformer, the AR-51 captures the same clarityas its predecessors and provides similar sonic characteristics, with its own unique distinctions. 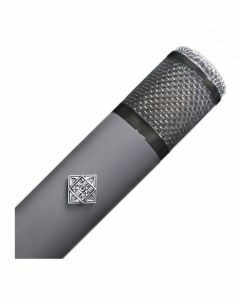 The R-F-T AR-51 is a high quality tube condenser that draws inspiration from the classic C12 and ELA M251E microphones. It provides a smooth mid-range, open top end, and solid, well-balanced low frequency translation. Telefunken Elektroakustik is well known for the historic recreation microphones found in the Diamond Series, which are meticulously made to historic detail with no expense spared. As such, these microphones become rather expensive for the average small studio or home enthusiast. With this in mind, the R-F-T Series of microphones was created. The R-F-T Series of tube condenser microphones utilizes American designed electronics in conjunction with New Old Stock (NOS) vacuum tubes and standardized parts from overseas manufacturers. Just like the Diamond Series, all R-F-T Series microphones are hand-built in Telefunken Elektroakustik’s South Windsor, Connecticut facility. With this line, Telefunken Elektroakustik is able to provide a lower cost alternative to more expensive microphone systems, without sacrificing the qualities that would be expected from a Telefunken Elektroakustik microphone. The AR-51 features the amplifier electronics of a C12 and ELA M 251E and pairs them with a dual sided large diaphragm TK51D capsule. At the core of the R-F-T AR-51 amplifier is a NOS ECC81 vacuum tube, which is coupled with the same German built Haufe T14/1 output transformer found in the C12 and ELA M 251E. As of October 2012's Audio Engineering Society conference, the AR-51 and AR-70 STEREO microphone now include the TK51D capsule, a 34mm dual-membrane, edge-terminated design. This larger surface area provides an extended low end and a smoother, more open high end in comparison to the original TK67D. The implementation of this new capsule brings the AR-51 and AR-70 STEREO sonically closer to the ELA M251E and C12 that employ the legendary edge-terminated CK12 capsule. In use, the AR-51 is a fantastic utility microphone. Its smooth mid-range, open top end, and solid, well-balanced low frequency translation make it a great choice on anything from vocals to drums and percussion to acoustic guitar to saxophone. The remote pattern selector, located on the power supply, provides 9 different polar patterns, giving the user a myriad of choices for how to record the source sound in a manner that will best complement their production. Each AR-51 microphone comes complete with M901 power supply, M801 25’ dual-shielded TX-7 tube microphone cable, M701 elastic shock mount and wooden microphone box.